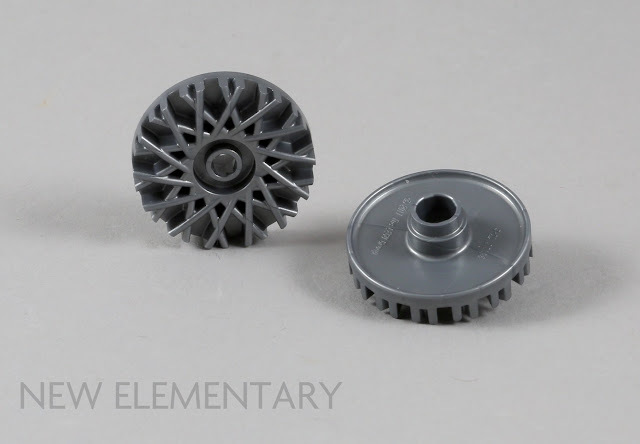 Clearly we love new elements here at New Elementary, and what better way to explore the potential connections and uses than to send a pile of new parts to some innovative and inspirational LEGO® builders. Let's introduce the elements released in the second half of 2018 that our guest builders will be taking a closer look at in the coming weeks. Black Design Plate 1X1, No. 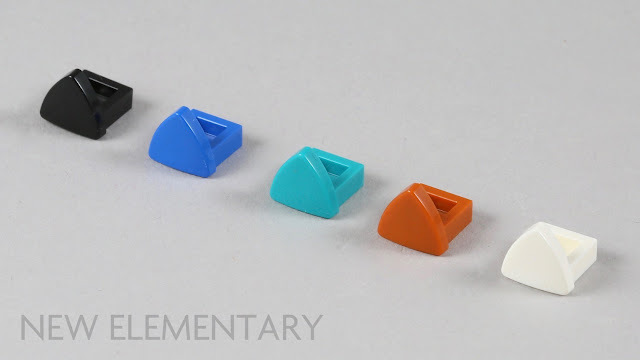 1 'floppy puppy ear' (Element ID 6231382 | Design ID 35463) is only found in one set, the Dalmatian Puppycorn blind bag from 41775 Unikitty! Collectibles Series 1. Each Dalmatian Puppycorn has only one Black ear as the other is white. It also appears in Bright Blue [TLG]/ Blue [BL] (Element ID 6223617), Bright Bluish Green [TLG]/Dark Turquoise [BL] (6231379), White (6231380) and Dark Orange (6231383). All are exclusive to Unikitty sets at present. 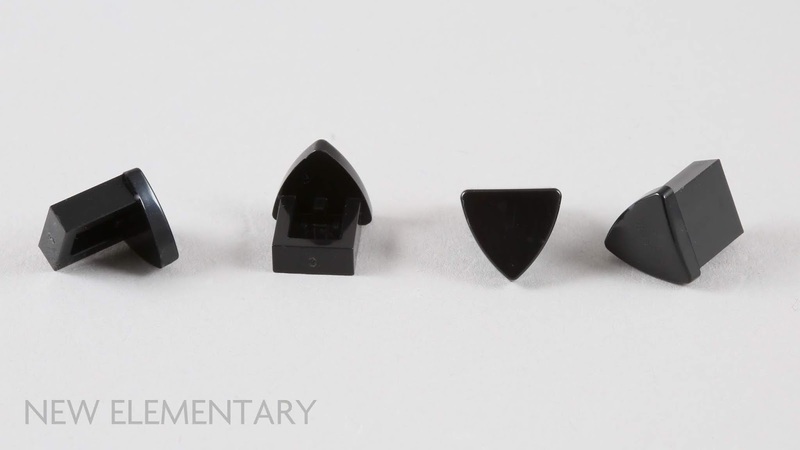 Sven Franic previously took a closer look at the floppy puppy ear as part of his Unikitty parts review series for us. Metallic Silver [TLG]/ Flat Silver [BL] Hub Cap, dia. 24, NO. 1 (Element ID 6227156 | Design ID 37195) is only found in one set at present, 10262 James Bond Aston Martin DB5. Read our review of 10262 James Bond Aston Martin DB5 here. Medium Stone Grey [TLG]/Light Bluish Gray [BL] Plate 1X1, W/ 1.5 Plate 1X1, Downwards (Element ID 6248078 | Design ID 36841) has appeared in this colour in 23 sets at time of writing, despite just being released last year as a new mould. This part also appears in five other colours including Earth Blue [TLG] Dark Blue [BL] (Element ID 6254479), Bright Bluish Green (6242488) and Medium Blue (6248079) as pictured, and two others not pictured – Dark Orange (6248949) and Medium Lavender (6261294). Dark Stone Grey [TLG]/ Dark Bluish Gray [BL] 1X1, W/ 1.5 Plate 1X1, Upwards (Element ID 6225494 | Design ID 36840) has also appeared in 23 sets to date. The two sets with the highest quantity of this particular element are 21311 Voltron with 14 and 76114 Spider-Man's Spider Crawler with 16. This part also appears in four other colours; Black, Reddish Brown, Cool Yellow [TLG]/ Bright Light Yellow [BL], White and one I do not have yet, Flame Yellowish Orange [TLG]/ Bright Light Orange [BL] (6249235). Black Lamp, No. 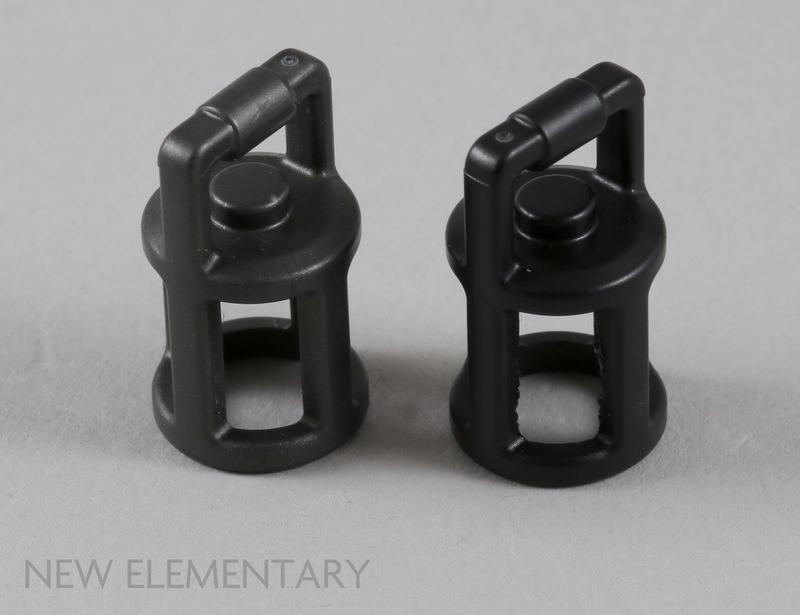 1 (Element ID 6227901 | Design ID 37776) appeared in four sets in 2018, including the LEGO Xtra 40312 Streetlamps polybag, however there is only one in each set. 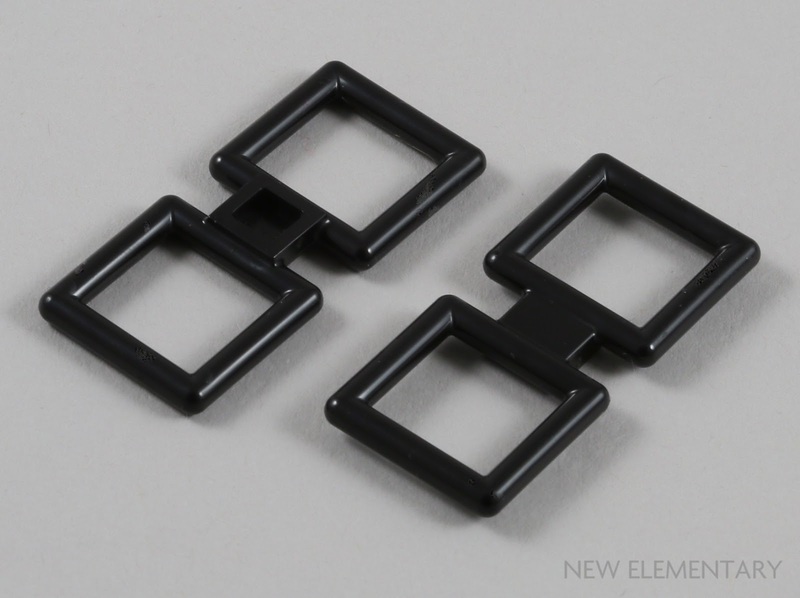 When I took a look at this element as part of our Harry Potter and the Enlightening Elements post, I used the Titanium Metallic [TLG] / Pearl Dark Gray [BL] (Element ID 623411) version that appears in the Wizarding World sets. Pictured below, Titanium Metallic is on the left and Black on the right; it's a subtle difference from a distance but much more apparent when comparing the two side-by-side. Black Wand on Sprue (Element ID 6232209 | Design ID 36752) was a favourite new element of mine from 2018 releases. I took a closer look at both the sprue and the wands from the Wizarding World theme when reviewing the new parts. 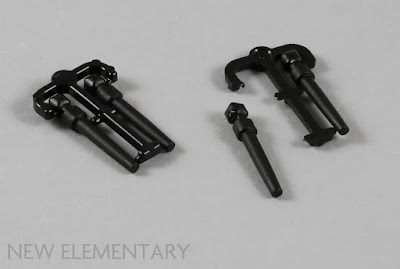 There's a host of connections if you consider the element on and off the sprue, so I'll be intrigued to see what our builders come up with. 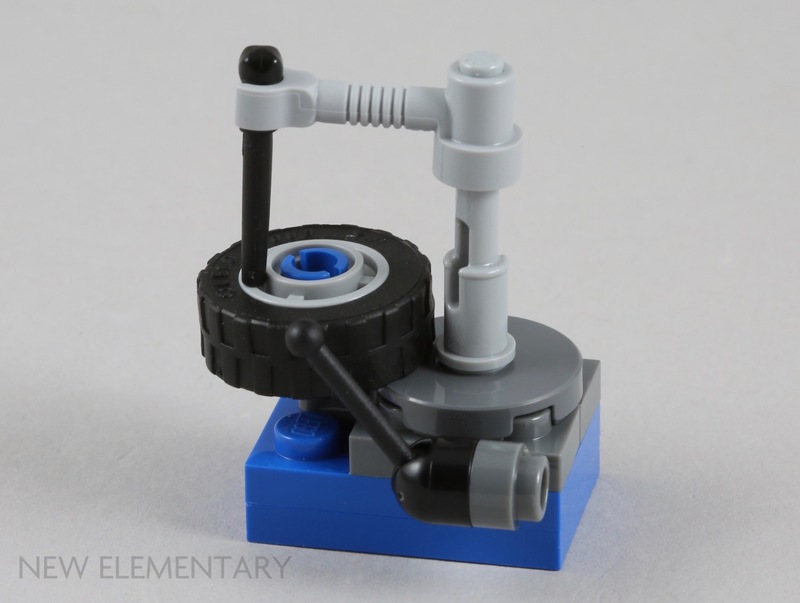 There was a fun use of this element in this years modular, 10264 Corner Garage, as part of the wheel mounter. 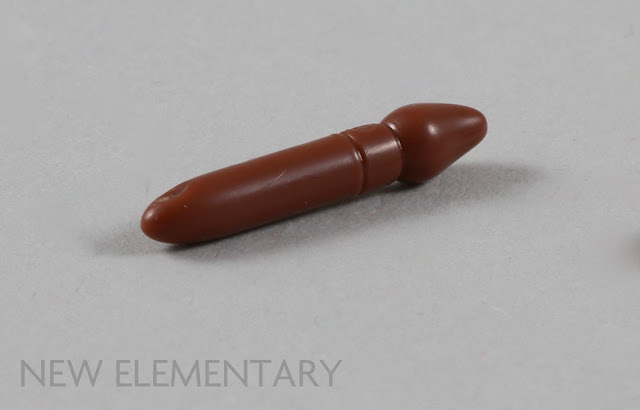 Wand on sprue also appears in Dark Brown (6235076), Reddish Brown (6232210) Dark Orange (6235072), Sand Yellow [TLG] / Dark Tan [BL] (6235074), Medium Lilac [TLG] / Dark Purple [BL] (6236260) and White. 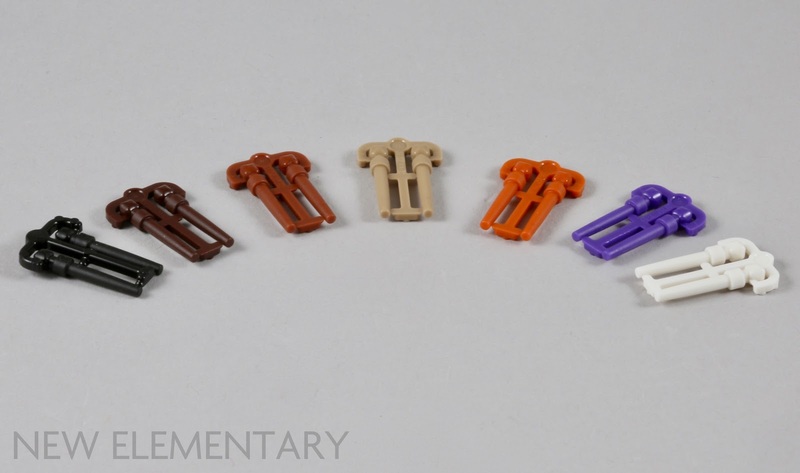 If you look at the bottom of our earlier post dedicated to the wands, you will see links to the sets that contain each colour. 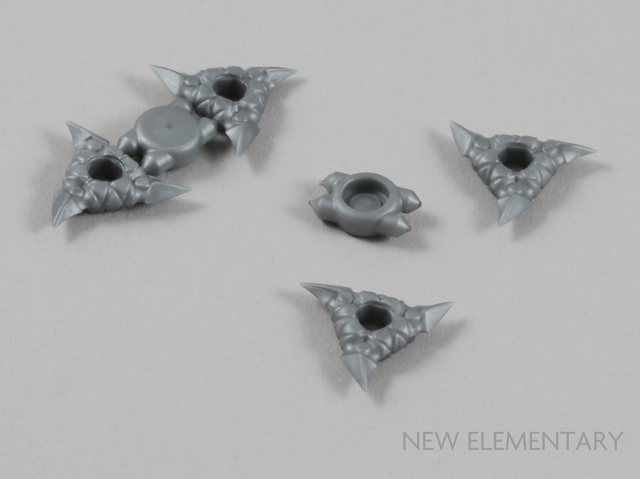 While the wand element is still available, the design of the sprue has been simplified and so this element has had a short life in its original form. Black Lattice 2X6, W/ 3.2 Shaft, No. 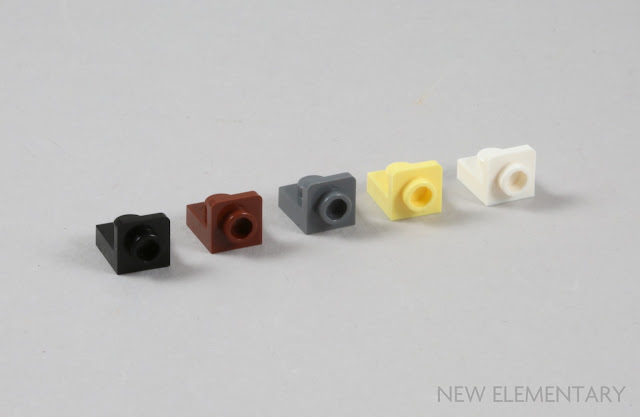 1 (Element ID 6208551 | Design ID 35366) first appeared in 41597 Go Brick Me as one of the two optional glasses for Brickheadz characters to wear. 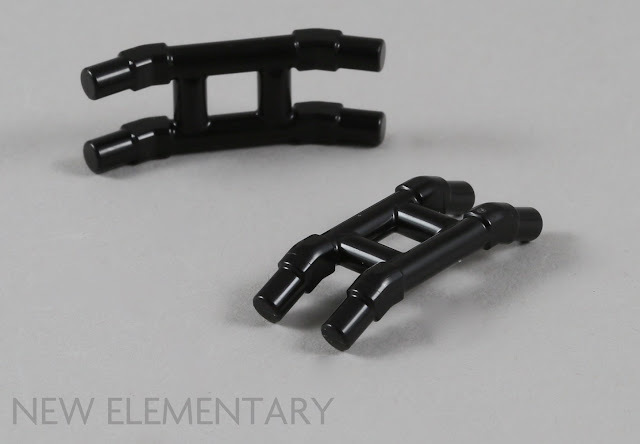 The element later appeared in 10261 Roller Coaster but has only ever appeared in Black thus far. 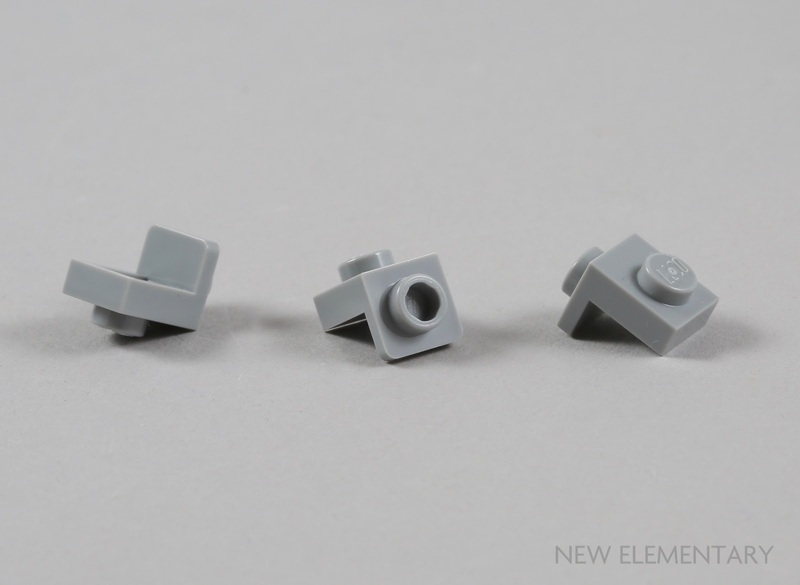 Chris' review of 41597 Go Brick Me showed us that the 3.18mm diameter frame offered a much greater choice and angle of connection than the round glasses, so for this reason the 'square glasses' made it into our parts fest over the round ones. 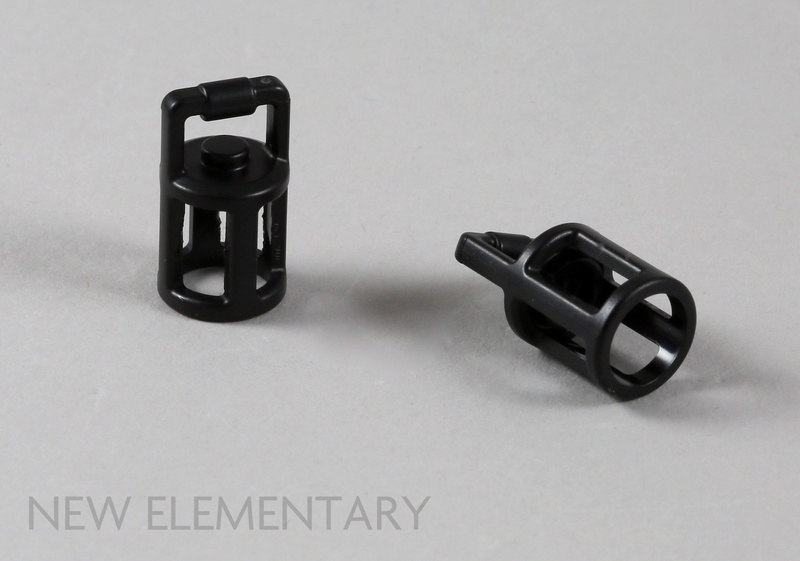 Black 3.2 Shaft Element, No. 1 (Element ID 6226706 | Design ID 37494) is a relatively rare part as it only appears in two train sets and only in Black at the moment. You will find one in 60197 Passenger Train and two in 60198 Cargo Train. 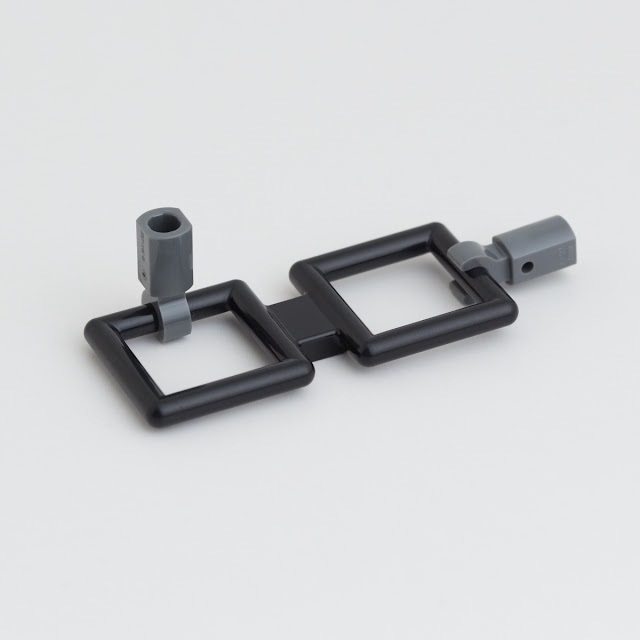 It's used as the pantograph to conduct electricity from overhead lines but we thought the plentiful 3.18mm connections would make it ideal for a parts fest. White Candle No.1 (Element ID 6234807 | Design ID 37762) only comes in white thus far and appears in many of the sets in the Wizarding World theme. We took a closer look at this element as part of our Harry Potter and the Enlightening Elements post a couple of months ago. The candle is made up of two sections; a narrower 3.18mm bar that is 3mm long and a wider 5.8mm hollow portion that accepts 3.18mm bar connections in its base. 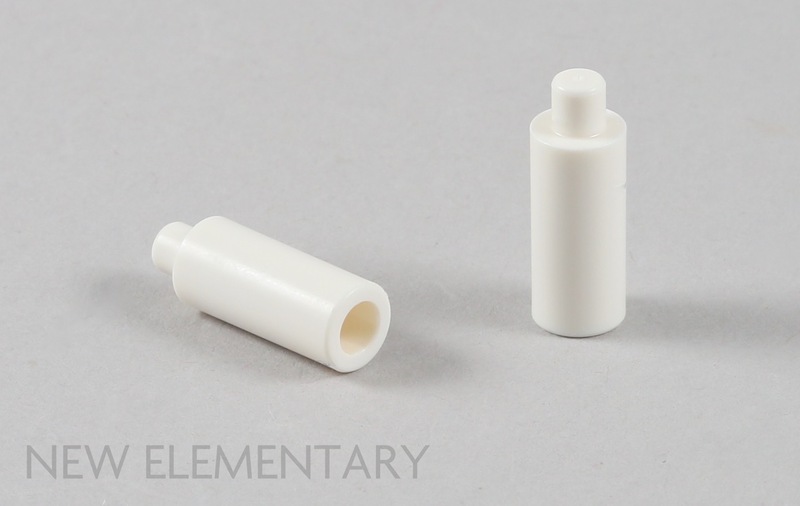 White Tile 1X3, Inverted, W/ 3.2 Hole (Element ID 6223491 | Design ID 35459) was first introduced within the Unikitty theme last year but can be found within 21043 San Francisco, 21150 Minecraft Skeleton BigFig with Magma Cube and a couple of THE LEGO MOVIE 2 sets. 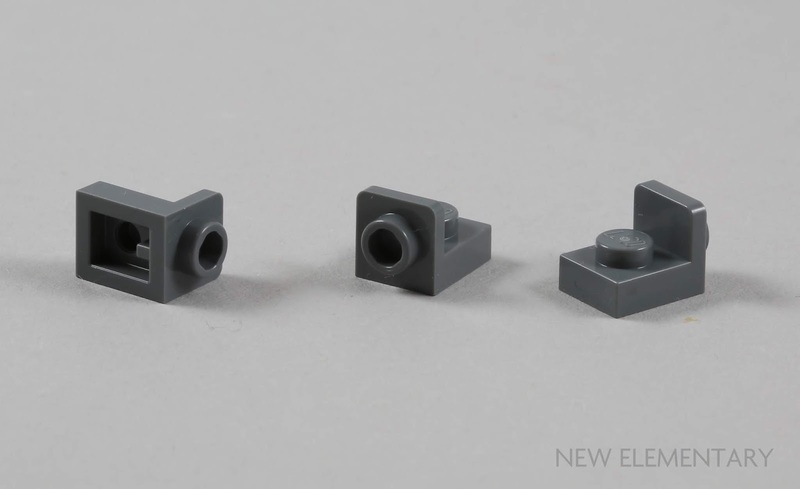 Sven has already taken a closer look and made some fun builds using this part. This element appears in eight colours in total: White, Spring Yellowish Green [TLG]/ Yellowish Green [BL], Dark Green [TLG]/Green [BL], Brick Yellow [TLG]/ Tan [BL], Nougat [TLG]/ Flesh [BL], Dark Orange and Bright Purple [TLG]/Dark Pink[BL] as shown above. You will also find Flame Yellowish Orange [TLG]/ Bright Light Orange [BL] in 70820 LEGO Movie Maker. While not a new mould, Reddish Brown Mini Brush (Element ID 6046576 | Design ID 15232) is a great addition to the unprinted selection of minifigure utensils. I find unprinted versions more flexible when using them out of context in creations. At present, the unprinted brush is available in two sets: 71043 Hogwarts Castle and the gift-with-purchase set, 40289 Diagon Alley. Silver Metallic [TLG]/Flat Silver [BL] Shurican Star Ø3,2 (6117255|19807) is supplied as two held together by a central sprue. The element is distinct from the smooth-handled similar element, Star With Ø3.2 Wheel (Design ID 93058) which has not been seen since 2014. With the postman taking parcels full of these elements to great LEGO fan builders in Russia, Germany, Denmark, Sweden, New Zealand, USA, Italy and Austria, we can't wait to showcase the results. Your black lantern is showing an ugly amount of flash, considering how new the element is (wow, that sentence feels so weird for an article that has nothing to do with DC). That's not really a good sign. The Unichinny tile is particularly frustrating. Aside from the fact that they haven't released it in blue, allowing an upgrade to Space Kitty, just look at all the versions of Unikitty that are coming out for TLM2. 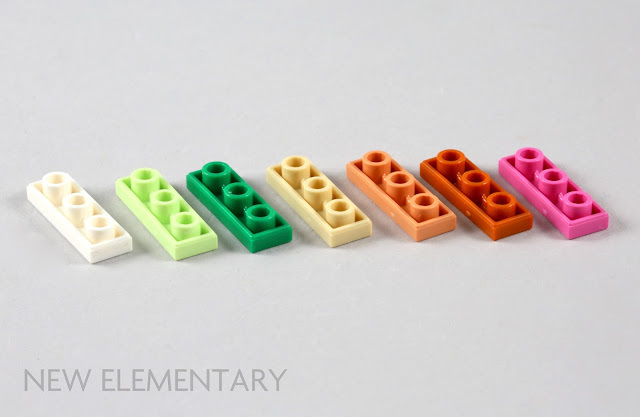 Pink versions in 70828, 70833, and 70822 all come with the new under-tile. Red version in 70831 and the pink CMF come with the old construction. What gives? And I'm really curious to see what the geometry is on the new pantograph top. Do the tops create a full 90° transition? Do they line up "on grid" in a useful manner? Are they exactly one stud apart? If they came in a set that wasn't a train, I'd be wondering why the first we're seeing of them here is a parts festival, but I guess a train has a terrible ROI for a site like this. 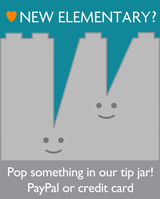 Too expensive for too few new elements to show off. 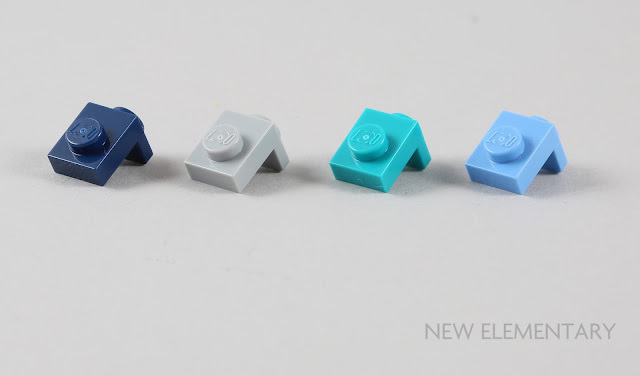 Funny thing is, Brickset releases lists of new elements (both completely new shapes and new colors for old shapes), and I don't recall seeing this there either. Of course, by the time I got started on the list, some of the elements had probably already been sorted with tags, so the "handy" link had ever diminishing returns the later you first discovered it. Yeah, now I look at it, that Black lantern does look really rough...I wonder if I just happened to pick a rather rough one to photograph. No flash to be seen. Did you buy yours recently, or back when the street lights XTRA packs first came out? I know mine wasn't in the very first batch because they were S@H exclusives for at least a month, and I got mine either at a LEGO Store or a LEGOLAND Discovery Center, soon after they started stocking them. Well, now (and I hope you can appreciate the multiple levels of irony here), I guess I need to finally take the tiles and update my "Flash trail" kit with them, which I've just been procrastinating on for so long that even sloths would be getting impatient. Wait...is that actually flash, or did you get a short-shot? Upon closer examination, it looks like the front, right bar may be thinner right below the midpoint. 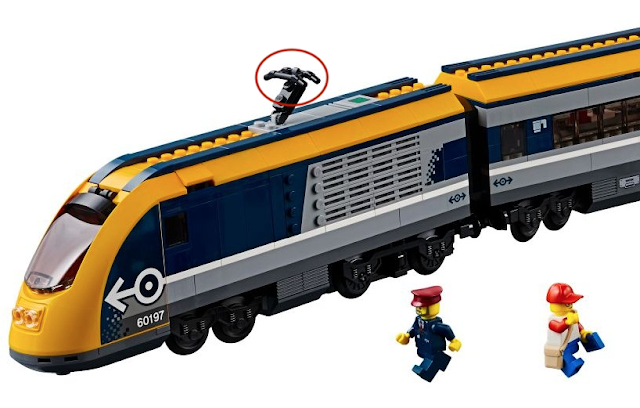 You know, it just occurred to me that you could probably do some interesting things integrating that new pantograph piece with CCBS parts... the two bars at the "ends" would fit perfectly into the front of most shells as well as some other weapon or tool parts.